The quintessential ‘baby grand’ piano, the Model M by Steinway & Sons measures 5’7″ in length. With the first Model M rolling out of the Steinway Factory in 1911, these pianos have grown to be a sought-after balance between manageable size and high-level performance. The Model M has become the most popular grand piano ever produced by Steinway & Sons. First introduced through the company’s New York factory, the Model M is currently in regular production in both Queens and Hamburg. Steinway Model M #247097 was built in 1926 in the company’s New York Factory. Fully restored, this piano is fully suited for either the amateur or professional musician. The piano’s action has been analyzed and the finest, dimensionally correct parts have been used in its restoration. This includes new wippens and new premium Royal George felt hammers on new octagonal hornbeam shanks and flanges. The original ivory keytops have been restored and the original ebony sharps were hand sanded and polished. The action was regulated and voiced to allow for a responsive touch and the classic Steinway quality of tone. New premium music wire and custom manufactured copper wound bass strings have been coiled to blued tuning pins. These were driven into a new custom fitted hard maple pinblock. A new soundboard constructed of the finest quality close-grained spruce was custom tappered and fitted to the piano’s case. The imposing cast iron plate has been given new life and has been sprayed with a rich bronzed polyurethane. The cabinet was fully refinished in a rich satin ebony and is stunning when combined with the restored original nickel hardware and polished brass bolt caps. Fully restored, this golden age Steinway grand fully embodies the traits expected of a world-class grand piano. Our piano rebuilding process is tailored with the primary focus being the performance of the piano as a musical instrument, capable of supporting the artistry of any pianist – amateur or professional. 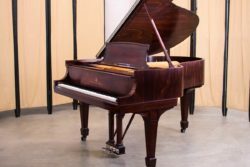 We have specialized in Steinway piano restoration for over four decades and continue to advance the high level of craftsmanship that was once standard during the ‘golden age’ of piano quality. This piano has been fully rebuilt and regulated. We are confident that you will be quite pleased with this concert level, historic Steinway grand piano. We spend many extra hours in the regulation and voicing of each of our rebuilt pianos. From the initial action regulation to the final weigh-off, each step is taken with great care in order to create a piano worthy of the name affixed to its fallboard. This Steinway Model M baby grand piano will be no exception. Our process ensures a warm, broad range of tone and a buttery, highly responsive action. This high level of responsiveness and nuanced tone allows the artist to easily unleash a great amount of expression. There is no other piano quite like a Steinway! Error: Error validating access token: Session has expired on Thursday, 10-Jan-19 19:00:02 PST. The current time is Wednesday, 24-Apr-19 22:07:43 PDT.